The defunct French label Dante (sometimes called LYS, but LYS was the alphabetical part of their label numbering code) was known mainly for its wide and unparalleled catalog of historical reissues – some apparently pirated from other labels’ reissues, some also genuine from the original 78rmps – but it is less known that they also had a smaller roster of original productions, mainly of solo piano and chamber music. In fact, the label started out with these original productions (and the first recording ever of Godowski’s Studies on Chopin’s Studies, played by Geoffrey Douglas Madge) before branching out in what began as reissues of historical pianists (Historical Piano Collection). Their original productions of chamber music were released under the label name LYS and most are so badly listed that it is pure chance to chance on them, which is what happened to me with this one, of which I had not been aware of. 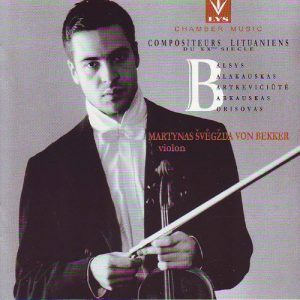 It was recorded in 1997 and its program is original: it has the young Lithanian violinist Martynas Švėgžda von Bekker, born in 1967, play solo violin pieces by five contemporary Lithuanian composers. Some of them are not totally unknown in that they’ve had previous CD exposure: Osvaldas Balakauskas (b. 1937), represented here by, regrettably, only two from his three-Waltz suite La Valse, and Vytankas Barkauskas (b. 1931) with a Partita. The others are new encounters for me: Eduardas Balsys (1919-1984) with his Concerto for solo violin, Borisas Borisovas (b. 1937), “Dedication to Heifetz”, and the youngest and only female composer, Rasa Bartkevieiûté (b. 1967) with a short “Melody” (she’s certainly disappeared from the radars: a Google search on her name yields only one result, and it is a listing of this very disc). TT is a short 47:58. All those composers remain traditional in outlook – no extended performing techniques ala Xenakis here, hardly even a sul ponticello (only in the Postludium of Barkauskas’ Partita) or a col legno, and a musical language that doesn’t stray far from Bartók’s solo violin sonata. The first Waltz of Balakauskas uses harmonics, the Postludium of Barkauskas’ Partita some sul ponticello and harmonics, and that’s about it. Balsys’ Concerto remains very close in formal structure and language to Bartók’s solo violin Sonata, integral with the second movement fugue, and Barkauskas’ Partita, very similar to Balsys’ concerto in its architecture (sharing the prelude, the toccata and the tensely lyrical slow movement) is post-Bartók/Shostakovich, tense and thorn, but tonal, with a short flight into a more contemporary language only in its final (and short) Postludium. 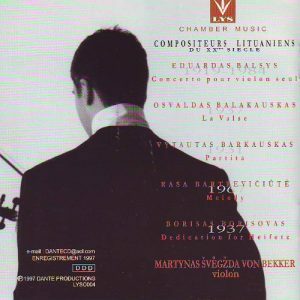 Borisovas combines those formal elements in the course of his 6-minute Dedication. Bartkevieiûté’s Melody is interesting for its tense, atonal lyricism and its intermittent use of two simultaneous melodic lines. I happen to have another recording of Barkausas’ Partita, by Gidon Kremer, on his CD “From My Home” on Teldec, recorded a little more than a year before Bekker’ program. Bekker is fine here, but his dryer sonics afford less comfortable hearing than Kremer’s, and Kremer is also the more imaginative fiddler in his renditions of the sonic effects of Barkauskas’ score. None of this is important, but it offers an interesting outskirt in off-the-beaten-track repertoire and composers.